Reducing Soybean Seeding Rates: Can I reduce soybean seeding rates and still maintain yield? It’s a common question from soybean growers, especially those seeking to reduce input costs. Every year during winter meetings I share what our growers have found. We now have 11 years of On-Farm Research proven data. The findings? Reducing soybean seeding rates from 180,000 or 150,000 seeds/acre to 120,000 seeds/acre doesn’t statistically reduce yields in 30- or 15-inch rows in silty clay loam and silt loam soils in south-central and eastern Nebraska. Results of 18 studies showed for seeding rates of 180K, 150K, and 120K seeds per acre, average yields were 69.0, 68.7, and 68.4 bu/ac, respectively (Figure 1). The early studies within this dataset all had seed germination of at least 90% listed on the seed bag. In all but two situations (seeded at 180,000 and achieving 88% germination), the growers were able to achieve 90% or greater of their planted stand. The latest soybean varieties as the research was conducted from 2006-2017. Erect and bushy type varieties in growth architecture. Higher and lower yielding situations. Fourteen irrigated fields and four non-irrigated. Hail events occurring from cotyledon stage to R2 in some of these fields. Crusting in some non-irrigated fields. Seed treated in some fields and others without (determined by grower’s planting date). In some years, pod and seed count data were also collected; the data showed similar numbers of seeds/acre and ultimately yield per acre. Observations of increased plant branching at lower seeding rates and difficulty in telling the seeding rate treatments apart as the season progressed. Our research data for 11 years shows no statistical yield differences in seeding rates from 120,000-180,000 seeds/acre in 15- or 30-inch rows in silty clay loam or clay loam soils. Thus, reducing seeding rates is a way to consider reducing input costs for 2018 without impacting your yield. If you dropped your seeding rate from 150,000 seeds/acre to 120,000 seeds/acre, you could save $10.08/acre, assuming a yield loss of 1 bu/ac, a seed cost of $60 per 140,000 seeds, and a savings of $25.71/ac on seed. 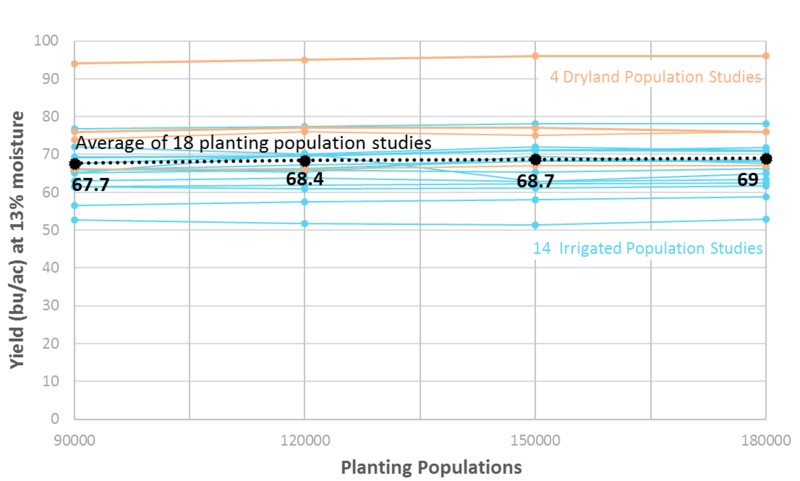 Thus, if you plant between 140,000-160,000 seeds/acre, consider dropping your seeding rate to 120,000 and aiming for a final plant stand of 100,000 plants/ac based on our research findings. If you plant at 180,000 or more seeds/acre, consider dropping your seeding rate to 140,000 seeds/acre as a step-wise increment. Still hesitant? Consider trying this yourself for your location! Consider using either this Two Population Treatment Design or Four Population Treatment Design. You also can download the Nebraska On-farm Research app, available in Apple and Android, to help you set up your plot design to obtain scientific results. If you have questions or need help setting up your research project, please contact me or anyone involved with our Nebraska On-Farm Research Network. To view all the graphs and additional data regarding 15″ row spacing with reduced seeding rates, please check out this week’s UNL CropWatch at http://cropwatch.unl.edu. Beginning Soil Moisture: On Good Friday, I installed soil moisture sensors down to 4′ in non-irrigated no-till fields at Bladen and Lawrence. Last week I added three more sites at Clay Center, Superior and Byron. Thus far, the 3′ and 4′ are dry in all those locations other than Clay Center (only dry at 4′). At Superior, I could only get the soil probe in the ground 6″ into actively growing rye and 1′ in cover that winter-killed. I was just curious what kind of moisture existed currently in the southern tier of counties. I realize planting plans are in place and that we often receive rains in April/May. Hopefully it provides information that can be helpful in how to use that soil moisture. If we don’t get necessary rains, you may consider switching to a different crop, growing feed if you have cattle, or not terminating actively growing rye as originally planned but perhaps using it for feed. Will share graphs next week and I appreciate the growers allowing me to install these in their fields! My top question the past two weeks has been about dicamba training. I just received the information regarding this training from our pesticide program coordinators. First, to clarify some mis-understandings: Dicamba training is required for those applying the following dicamba products: XtendiMax®, FeXapan™, and Engenia®. These products are all Restricted Use Pesticides (RUP) this year; thus, you have to be a certified applicator to purchase and use these products. Dicamba training is not required if you’re applying dicamba corn products (unless it is the above-mentioned products). Second, pesticide training of any kind is not the same as dicamba training. Dicamba training is completely separate. Having your pesticide applicator license does not qualify you to apply RUP dicamba in 2018. You need to be a certified pesticide applicator to purchase the RUP dicamba products. You need to be a certified pesticide applicator and complete dicamba training to apply the RUP dicamba product. So hopefully that helps clarify who in your operations need this training. Nebraska Extension online training course hosted by eXtension. See the link at : https://campus.extension.org/login/index.php (1.25-1.5 hours). County-hosted training sessions at the option of local educators presenting the video which is the same as the online training (1.25-1.5 hours). RUP dicamba product (XtendiMax®, FeXapan™, and Engenia®) manufacturer sponsored training. Each manufacturer will advertise individually. I took the online training so I could better answer your questions. The link to the UNL online dicamba training can be found at the http://pested.unl.edu site or you can go directly to the training at: https://campus.extension.org/login/index.php. Once at this site, you will need to create an account. You will then be sent a confirmation email and upon opening that, you will be logged in. From the course list choose “pest management”. Then scroll and click on “Online Training for Dicamba Herbicide”. You will then need to register for the training. It will ask you to add your Nebraska pesticide applicator number in a specific field as well. Your name and applicator number are required before you begin the training. You can then click on the first video followed by the first quiz. It keeps track if you completed the entire video or not before you can advance. I felt the information was good overall and I appreciated the fact that they mentioned how corn dicamba applications also influenced the problems we saw in 2017. They also share quite a bit of research regarding volatility, conditions/timing of temperature inversions, dosage amounts and effects on yield. The quizzes are short and were fairly common sense. You can click to check each answer once you have selected your choice and will have to submit all your answers before moving on. When you have completed all the videos and quizzes, you can have a certificate emailed to you. You will also be officially entered into Nebraska Department of Ag’s database. NDA said they will only honor those names in their database as those who’ve completed dicamba training. NDA is asking ag retailers selling these RUP dicamba products to check the NDA database to ensure the person applying the product has received dicamba training. NDA’s dicamba information including record keeping forms, etc. can be found at: http://www.nda.nebraska.gov/pesticide/dicamba.html. The other thing you need to know: some have asked if a group of people can watch the online training at the same time at your farmstead. The answer is actually no from the standpoint you all would have to watch the training on separate computers/devices. The only way your name is recorded in the NDA database is through your registration name and pesticide applicator number on the training site. It only allows one person to enter his/her information to view the training and complete the quizzes. If you attend an NDA approved face-to-face training such as at Crop Production Clinics, you can train as a group but will still need to supply your individual names and pesticide applicator numbers at the training. Hopefully this helps clarify some of the questions you have and during this cold weather, you have the opportunity to get this training completed if you need it for 2018. May 27: Sunshine has been welcomed for corn amidst the rains we’ve received. Corn ranges from 1-4 leaf depending on emergence dates. For those who put the majority of nitrogen application pre-plant, soil and/or foliar samples may be necessary to determine the extent of nitrogen available to the crop throughout the season. May 27: Receiving numerous calls on marestail escapes in corn this year. At this point, there’s no options guaranteed for 100% control. Our Guide for Weed Management shows options for 80% control right now including: Buctril + atrazine, Buctril + dicamba, Hornet, Realm Q, Resolve SG/Solida or Resolve Q, and Status. Please read and follow all label instructions. For soybeans, options are even more limited and control mostly goes down to 70%. Page 116 of our Guide for Weed Management provides options for consideration. May 23: Corn is looking good for the most part with few major concerns yet. Some have commented on the yellow-looking corn. This is most likely due to cool, wet soils rather than any nutrient issues. There may be field-specific issues such as saturated soils, compaction, and some herbicides that can cause this yellowing too. Also had a call on cutworms in seed corn but not widespread calls on this yet. Extension Educators have set up light traps for tracking cutworm moths and you can find that information here: http://go.unl.edu/rhhe. Cutworms will cause the most damage the first 7 days after corn emergence so scouting is important. The York County Corn Grower Plot was planted on April 24th with the corn currently at 2 leaf stage. Special thanks to Ron, Ray, and Brad Makovicka for hosting and the work put into this plot each year! 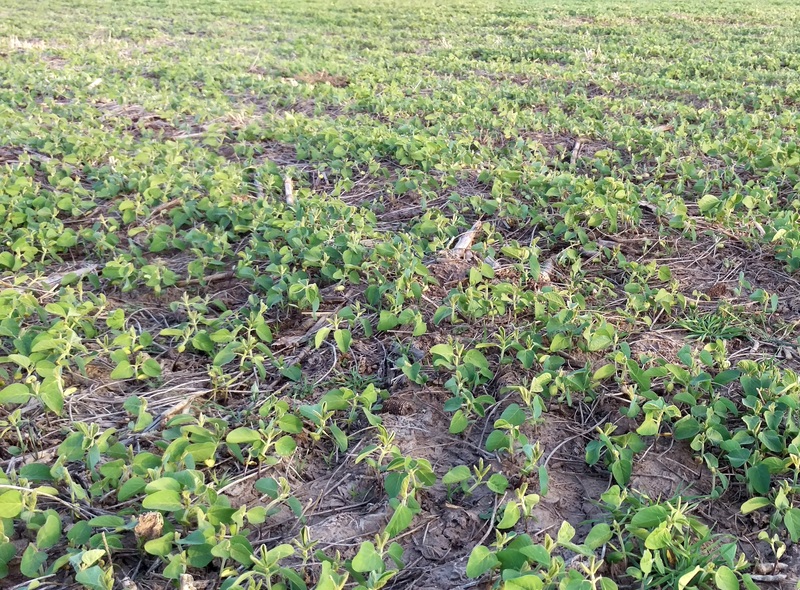 May 23: Soybeans are emerging and the concern several have discussed is crusting. Soybeans have an amazing ability to push through crusted soil and we were hoping for rains this past weekend to soften the soil and help them along. I’ve watched soybeans lose both cotyledons when trying to push up through the soil. Surprisingly these can survive if the growing point is still intact, and a small plumule will begin to develop. The plumule, which is the seedling stem tip and its undeveloped leaves above the cotyledonary node, may remain, but without the cotyledons to serve as a carbon and nitrogen source, development of new seedlings with small leaflets will be slow. These plants may not become competitive with surrounding plants. Therefore, when counting seedlings to determine plant stand after a soil crusting event, count only the seedlings that have at least one cotyledon. You can count seedlings missing cotyledons if they have large unifoliolate leaves that will soon unroll. Information from Purdue University shows that losing both cotyledons can lead to 2-5% yield loss. May 15: After last week’s storms, some have wondered how long their germinated seed and emerged plants could survive under water. There isn’t a great deal of research regarding germinated corn hybrid seed. From some corn inbred research, it is not expected that germinated seed can survive in flooded conditions for more than four days. Within 48 hours, soil oxygen becomes depleted and crusted soils from heavy rains can lead to reduced emergence. A two day flooding event after soybean seed germination and imbibition (water uptake) reduced soybean stands from 20-43% in research conducted in the early 2000s. Corn less than 6 leaf growth stage at temperatures less than 77F can survive around four days. Temperatures higher than 77F may only allow those emerged plants to survive around 24 hours. As waters recede and for those who received hail on young corn, it will be important to monitor your plant stand. The high rains received early May 2015 in Nuckolls and Thayer counties resulted in a number of early corn diseases including bacterial soft rot and systemic goss’ wilt which reduced plant stands. We also saw an onset of anthracnose and a Xanthomonas bacterial disease that we couldn’t do anything about. Correct diagnosis will also be important. We would recommend monitoring your plant stand in ten areas of your field, counting plants from two adjacent rows in each area and assessing the distance of gaps between plants. Digging in the areas where gaps occur can help determine if seedlings still have an opportunity to survive. Seedlings that have leafed out underground or are corkscrewed will most likely not develop normally and may never make it out of the ground; it’s a judgement call on your part. An article is also provided in CropWatch this week to help with stand assessment for corn replant decisions at: http://go.unl.edu/iic6. One thing to keep in mind with the final decision table from Iowa State is that it all rests on an assumption of optimum planting of 35,000 seeds/acre planted in a window between April 20-May 5. That may or may not be a realistic assumption for your field conditions. Another thing to keep in mind is that while on average, as planting dates move into May, corn yields tend to drop, 2016 may not be an average year and the best planting date for 2016 with the weather conditions we’ve had may not have been the earliest ones. Regarding gaps, ISU shares gaps from 1.3-2.8 feet result in an additional 2% yield reduction while 4-6 foot caps result in an additional 5% yield reduction. May 1: It never ceases to amaze me how quickly planting occurs each year! Corn planted the week of April 10th has emerged and for those fields that received hail from last week’s storms, I’m hoping we don’t see disease issues later on. Also of note, some have asked me about the CropWatch soil temperatures as they are higher than what some of you have been measuring in your fields before planting. The CropWatch soil temps at http://cropwatch.unl.edu/cropwatchsoiltemperature are averages of 24 hours under bare soil which may be different than the residue conditions in your fields and is an average of the entire day vs. one point in time. This may help explain some of the differences. Many stands of alfalfa are lush green with over a foot of growth at this point. I looked at some alfalfa in Clay County that got dinged by cold temperatures in areas of the field and stopped growing. At this time I’m also finding quite a few aphids and a few alfalfa weevils. A disease common this time of year called spring black stem can be observed in nearly all alfalfa fields right now in the lower canopies. This disease consists of small black lesions on the leaves which eventually cause the leaves to turn yellow and drop. Normally this disappears with later cuttings as humidity and rainfall are typically high during the first cutting and can be managed with cutting the alfalfa. One option to consider according to Dr. Bruce Anderson, our Extension Forage Specialist, is to consider cutting alfalfa before bloom. He shares that weather can cause long delays and alfalfa doesn’t bloom very aggressively during spring. Bruce felt there were advantages to cutting alfalfa when it is 15-20” tall before bloom during first cutting including: weather compared to later spring, spread out alfalfa harvest if you consider cutting one field earlier, reduction in insect and disease problems by early harvest, and high feed value. It also potentially allows the second cutting to be ready before the summer heat which can lower forage quality. Disadvantages include lower yield from cutting early which could be made up in later harvest, regrowth may be slower if cut early, and the need to allow for longer recovery after first or second cutting to maintain long-term stands. So, harvesting before bloom may be something you wish to test in one of your fields this year and consider how this works for you, especially if you did have some frost damage or are having insect/disease issues in your alfalfa right now. Symptoms of Sudden Death Syndrome (SDS) on leaves show green veins with discoloration between the veins (left photo). Signs of the blue/gray/white Fusarium fungus causing SDS on a rotted soybean root (right photo). Grazing corn residue provides many benefits to both livestock and grain farmers, yet many corn stalks in our area are not grazed for various reasons. With as much hail as we’ve had this fall, grazing is also an option to remove ears and kernels that were lost, preventing volunteer corn next season. Normally there is less than a bushel of ear drop per acre, but we most likely have more than that in some of our fields this year. Two kernels per square foot or one ¾ pound ear in 1/100 of an acre is the equivalent of 1 bu/ac yield loss. In 30” rows, 1/100 of an acre is 174’ long if you count in one row or 87’ if you count in two rows. 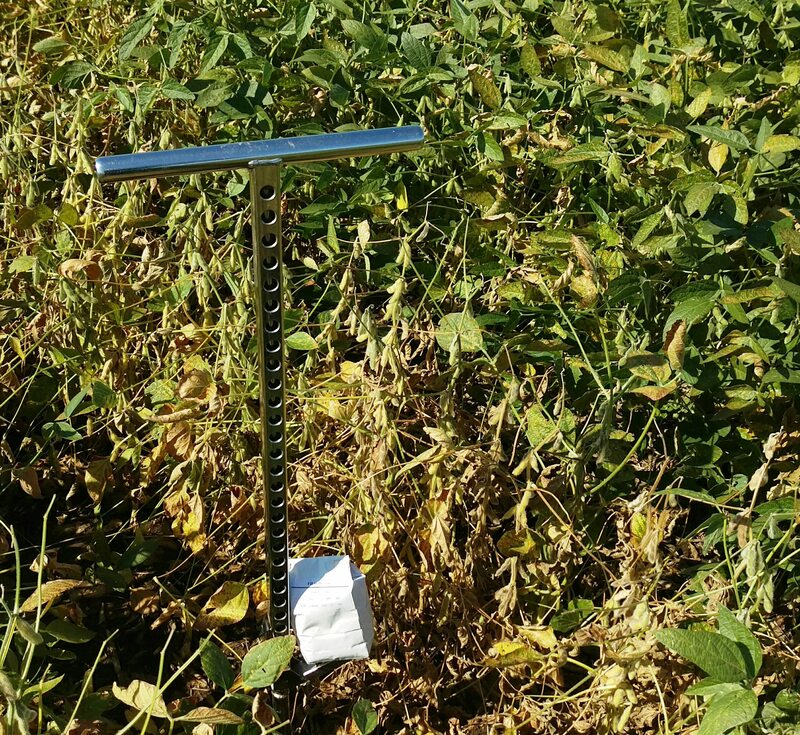 Soil samples (0-8″) for soybean cyst nematode (SCN) can be taken at any time but always good to sample areas that were affected with SDS to determine if SCN is also present. 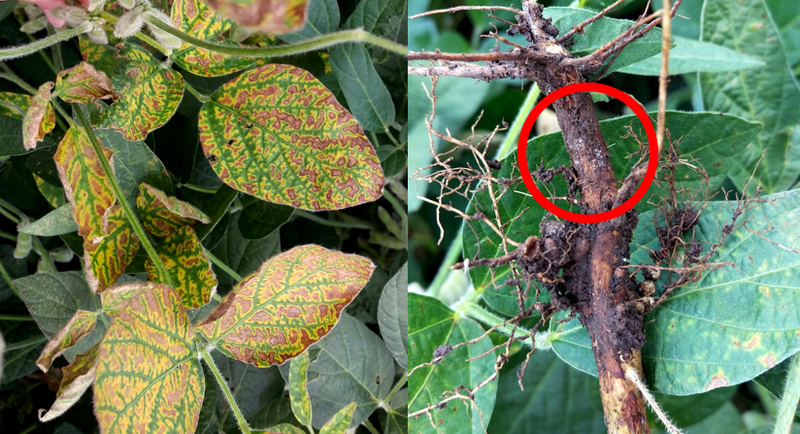 What may also be of interest to you is a recent finding between corn grain loss pre-and during harvest and sudden death syndrome (SDS) of soybean. Many asked me this this year, “Why did I see SDS this year when we’ve never had it in this field before?” It’s a great question and I often responded by saying we need to sample the areas affected with SDS for soybean cyst nematode (SCN) as the two diseases are synergistic. Sampling for SCN still remains free through your Nebraska Soybean Board Checkoff dollars and you can stop by the Extension Office for free sampling bags. Crop consultants should contact the UNL Plant and Pest Diagnostic lab directly at (402) 472-2559 if you are requesting 10 or more sampling bags. Anything that moves soil can transport the fungal soil-borne pathogens causing these diseases. 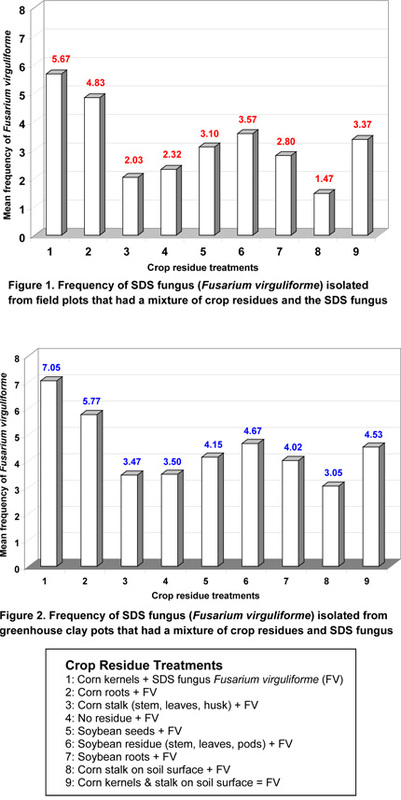 But recent research from Iowa State University also suggests that the fungal pathogen causing SDS (Fusarium virguliforme) survives on grain lost during the harvest process in fields and that SDS management in soybean actually needs to begin at corn harvest. Studies were conducted for two years in greenhouse and in field plots with nine treatments to determine the survivability of Fusarium virguliforme (Fv) on corn and soybean residue. The treatments were: 1-Corn kernels + Fv; 2-Corn roots + Fv; 3-Corn stem/leaves/husk + Fv; 4-No residue + Fv; 5-Soybean seeds + Fv; 6-Soybean stem/leaves/pods + Fv; 7-Soybean roots +Fv; 8-Corn stalk on soil surface + Fv; 9-Corn kernels and stalk on soil surface + Fv. The researchers consistently found in both the greenhouse and field experiments that Treatment 1 of corn kernels at average harvest loss resulted in the most SDS. Treatment 2 consistently resulted in the second most SDS. From Iowa State University, September 2010, “Good Harvest in Corn Should Help Manage SDS“. This helps to explain why some farmers are finding SDS in fields that have been continuous corn for a period of years, are finding SDS in corn and soybean rotation when little or no SDS was previously observed, and why SDS has increased in seed corn fields that may have higher harvest losses. They did not experiment with tillage systems and their recommendation is to reduce harvest losses to reduce the risk of SDS. Grazing residues can reduce your risk from these harvest losses and for those losses which were incurred with the hail/wind storms we’ve experienced since Labor Day. 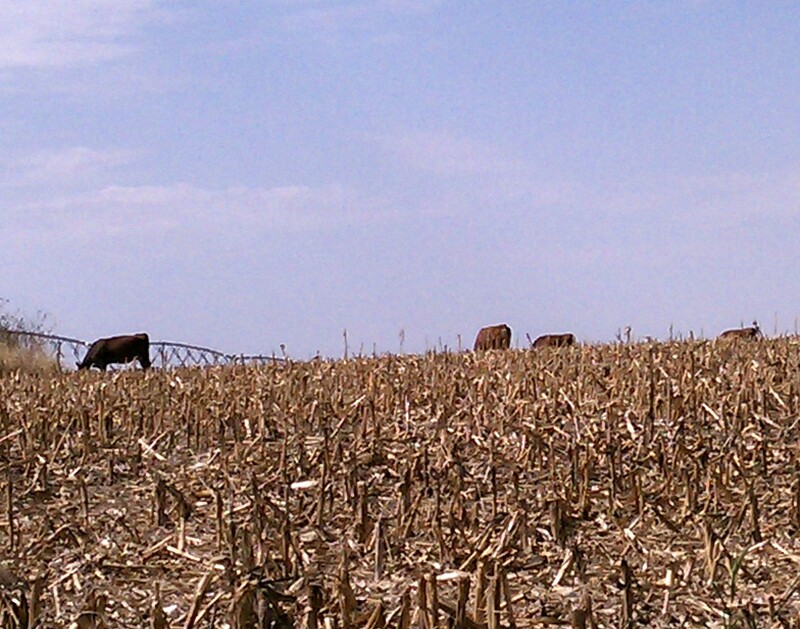 When grazing corn residue, cattle are selective. They will eat the grain first followed by the husk and leaf followed by the cob and stalk. It’s also important to be aware of grazing restrictions from herbicides applied to row crops; you can read more about that in this post. It’s nice seeing cattle being turned out into corn stalks! One point that I haven’t mentioned recently is that we all need to be checking the herbicide label for any grazing restrictions of crop residues. So check the labels from in-season applied herbicides to row crops and fall-applied herbicides to crop residue for any potential grazing restrictions…and any restrictions on grazing cover crops planted into crop residues following application of those chemicals to a row crop. If the label doesn’t specify any restrictions, then it should be ok. If you want to be on the safe side, a rule of thumb many chemical reps use is to use the pre-harvest interval for the amount of time to wait before grazing stalks. Some labels will say that residue should not be grazed or baled and fed to livestock. Sometimes studies were actually conducted to know there is a safety concern. In other cases, the chemical company may not choose to conduct all the studies the Environmental Protection Agency (EPA) required for labeling due to high costs. If that’s the case, the EPA requires the strongest restrictive language be placed on the label. Hail/rain/wind caused for soybean shatter and harvest loss. Volunteer beans have created green fields in the area. For those considering grazing, one needs to look at any herbicide grazing restrictions from herbicides applied in-season to soybeans as well. Dr. Bruce Anderson says, “Soybeans can cause bloat, but the incidence is low. The young green ones may be more risky. Founder would be possible problem with a sudden diet change. Too many unsprouted beans in the diet could cause excess fat; I think maximum is about 3 lbs beans per cow. I’d try to limit amount of grazing for a few days, maybe feeding a very palatable supplement like a ground forage/distillers mix and reduce the amount of this supplement each day for a week or so. And keep a dry, palatable hay always available free choice.” Additional information from the University of Missouri. Regardless, if it says there’s a grazing restriction on the label, the label needs to be followed as it is a legal document and the law. Your cattle may/may not be affected by grazing stalks or cover crops where a chemical with a grazing restriction is on the label, but there may be other concerns such as problems with the chemical affecting the calf or being retained in the cow’s milk. For quick references, the 2015 UNL Guide for Weed Management shows Forage, Feed, Grazing Restrictions for Row Crop Herbicides on pages 174-177. A new weed guide will be released January 2016. These pages just provide a reference; it’s truly best to read and follow the label. Recent wind and hail storms have created damage across our area counties in Nebraska and Kansas. 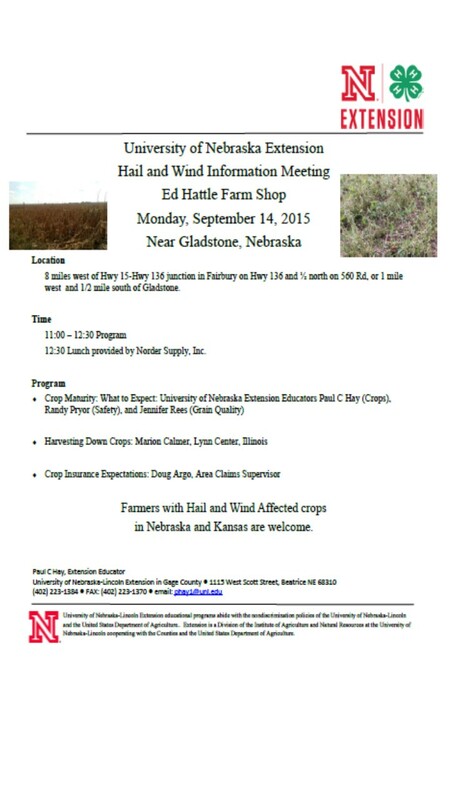 This brief meeting to be held on Monday near Gladstone, NE is designed to answer farmers’ questions regarding harvest, crop insurance expectations, and what to expect regarding crop maturity and future damage. Please click on the image to enlarge.